Bora A*, Prasad M**, Gupta AS***. The incidence of repeat cesarean sections has increased over the past few decades. One of the biggest risks is the risk of uterine rupture, making planning of an appropriate time for delivery of such a pregnancy a major decision. Such a case of previous two cesarean sections with history of an upper segment incision has been discussed here. The rate of cesarean delivery has increased over the past decade from 5% in 1970 to 32.3% in 2008  and a major factor behind this increase is a decrease in the number of vainal births after cesarean section (VBAC). This has lead to scenario where we encounter a vast majority of patients with previous two cesarean sections, and the risks and management may vary in each individual case. A 25 year old G3P2L1 registered in the antenatal department of our hospital in view of a previous upper segment cesarean section. She had one living issue and one neonatal death, and was referred to our hospital for further care. She was antenatally registered in a private hospital at 6 weeks of gestation and was compliant to antenatal care. Hemoglobin was 12.9 gm%, thyroid profile was within normal limits, fasting and postprandial blood sugars were 90 mg/dl and 100 mg/dl respectively; there were no fetal malformations and placenta was posterior. Her first pregnancy was 1 year after marriage, a spontaneous conception and she was managed at a rural peripheral hospital. At 9 months of gestation, she had preterm premature rupture of membranes and cesarean section was performed. Documentation regarding this pregnancy was not available. Male child of approximately 3 kg was born and was well till 3 months of life, when the child succumbed to severe gastroenteritis, details of which was not known. In her second pregnancy, the conception was spontaneous and approximately one year after the first pregnancy completion. Antenatal follow up details were not available. She denied being offered a trial of scar. She was delivered by cesarean section and detailed intraoperative notes were not available. However, there was a line diagram showing previous upper segment rupture and another showing the sacculation of membranes and intrauterine presence of the fetus (figures 1 and 2). Previous scar had ruptured, but placenta was not at the scar. Omental adhesions were present. However, there was no mention of type or location of incision taken in this procedure. 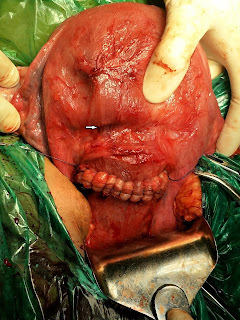 This pregnancy was a live birth fortuitously as the rupture of the upper segment scar had not resulted in expulsion of fetus into the peritoneal cavity nor had it affected the placenta. At 35 weeks of gestation in her current pregnancy, she presented to the emergency department with the complaints of pain in abdomen. There was no leaking or vaginal bleeding. Pulse was 80 beats per minute, blood pressure was normal and systemic examination was unremarkable. Uterus was approximately 36 weeks in size and no uterine activity was felt. There was no abdominal tenderness. Fetal heart sounds on doppler were 140 beats per minute, and non stress test was reactive. She was scheduled for a lower segment cesarean section after completion of steroid cover owing to her previous history of upper segment scar and its dehiscence in her previous pregnancy. Intra operative, flimsy adhesions were seen between the anterior uterine wall and lower uterine segment. Two transverse scars were seen, separate from each other. One scar was seen in the lower uterine segment but slightly high up and one in the body of the uterus approximately 2 cm below the insertion of the fallopian tubes. The scars were thinned out but there was no sign of dehiscence. 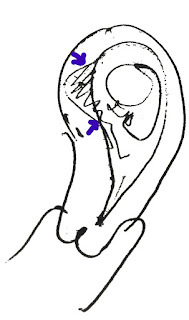 (figure 3) Fetus was delivered by a lower segment incision. Her post operative period was uneventful. She was discharged on day 4 post delivery. Figure 1. 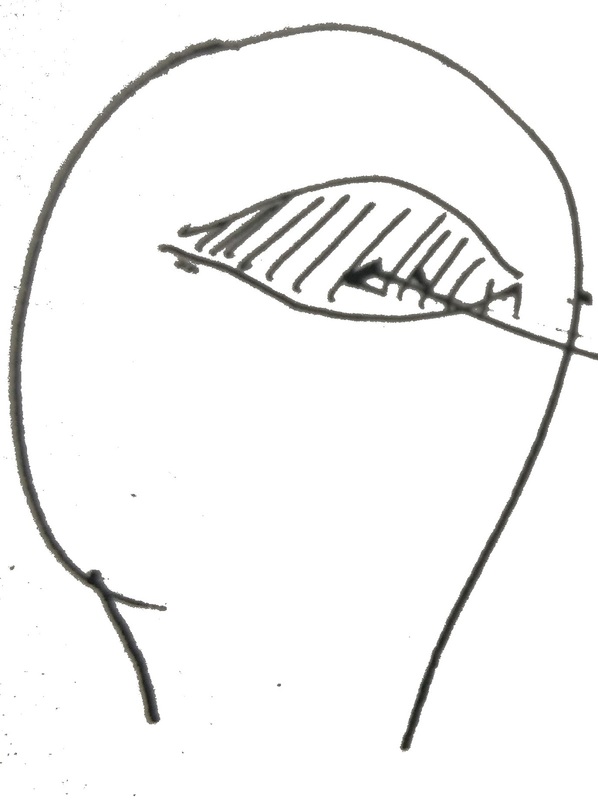 Line diagram drawn by clinician operating second CS indicating previous upper segment ruptured incision. VBAC is contraindicated in women with previous classical cesarean scar due to the high risk of uterine rupture. Our patient had one prior upper segment cesarean section and another prior lower segment cesarean section. This patient was not offered trial of labor in this pregnancy (third pregnancy) as diagrammatic details of her second pregnancy were available. Whether the patient was offered trial of labor during her second pregnancy is not clearly known. 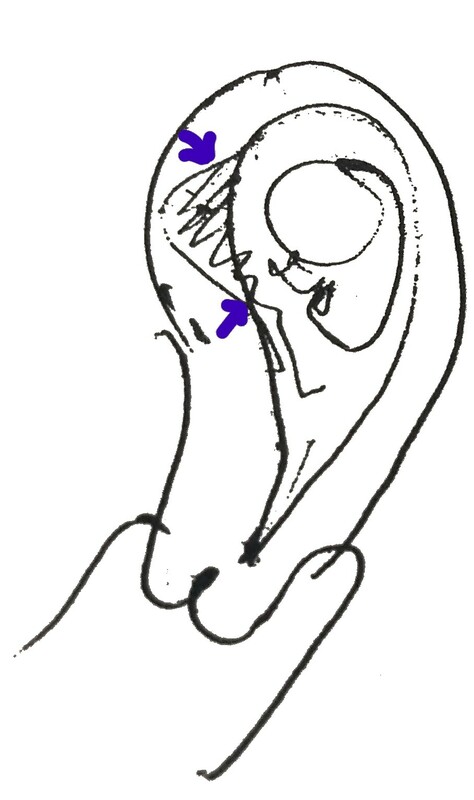 Intra operative finding showed two incisions on the uterus, both transverse one in the middle part of the uterine body and one in the lower segment as seen in figure 3. 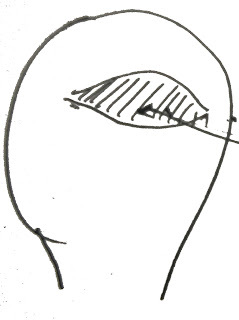 In the second cesarean birth the diagrammatic notes document the upper transverse scar rupture. It seems that the fetus was delivered not through this rupture but from a fresh lower segment scar (referral note had a mention of the same) through which we performed the current cesarean birth. However, since the upper segment scar had ruptured in the second pregnancy it is difficult to contemplate why the treating surgeon did not deliver that fetus through the ruptured upper segment scar but placed a fresh lower segment incision. This was confirmed by the intraoperative findings (figure 3). Figure 2 indicates that the fetus in the second pregnancy was a breech presentation. Probably an attempt to deliver the breech through the ruptured transverse upper segment incision may not only have resulted in difficulties, but trauma to the fetus and extension of the ruptured segment may have been the cause for not delivering the fetus through the rupture site. The first delivery through a transverse incision in the middle part of the body must have also resulted in difficulty in delivery of the fetus as neither the head nor the buttocks would be available for grasping unless the fetus was in the transverse lie. However, details of the same are not available and this is mere speculation. Usually the incision for a classical cesarean section is vertical on the uterine body. The presence of the transverse scar in the middle part of the upper segment probably suggests that the 1st surgeon was not adequately trained in obstetrics to identify the lower segment and instead of placing this transverse incision in the lower segment placed it in the middle of the upper segment. A catastrophic mistake would be taking a repeat upper segment incision. However, the recent RCOG guidelines state that patient with two or more prior lower segment cesarean deliveries must be counseled by a senior obstetrician and may be offered VBAC; only after specific points of discussion which include risk of uterine rupture, maternal morbidity and individual likelihood of successful VBAC (like giving a history of prior vaginal delivery) have been taken into account. It has also been opined that such labor should be undertaken only in a center with suitable expertise and immediate possible recourse to surgical delivery. However, this recommendation is grade C. The ACOG guidelines have also mentioned somewhat similar guidelines. [2,3] However, previous classical or “T” incision, prior uterine rupture, extensive transfundal uterine surgery are not considered as candidates for VBAC. Patients with a previous low vertical uterine incision are not found to be at an higher risk for uterine rupture as compared to the ones with a previous low transverse uterine incision. It is to be highlighted that above recommendations are only for those whose previous scars are well documented. Our case highlights the fact that documentation of details of prior operative procedures, and knowledge of a prior scar is very important before deciding the route of delivery. Absence of documentation of the first surgical procedure was the most probable cause of the rupture seen in the second pregnancy. In this patient's second pregnancy, the clinician was probably unaware of the higher incision. Many a times the patient or the relatives are unable to narrate the entire sequence of events or the exact details of a prior condition or a prior surgery. In such cases, previous documents, papers amount to a valuable source of information. The first time a patient presents to a doctor, meticulous history taking is mandatory. Reviewing the details in every visit, with the intent of eliciting any extra information is also recommended. Documentation of the second delivery surgery notes allowed us to deliver her before term (at 35 weeks of gestation age) so as to circumvent repeat scar rupture of the upper segment. Some situations where transverse fundal uterine incisions were used successfully have found mention in literature. 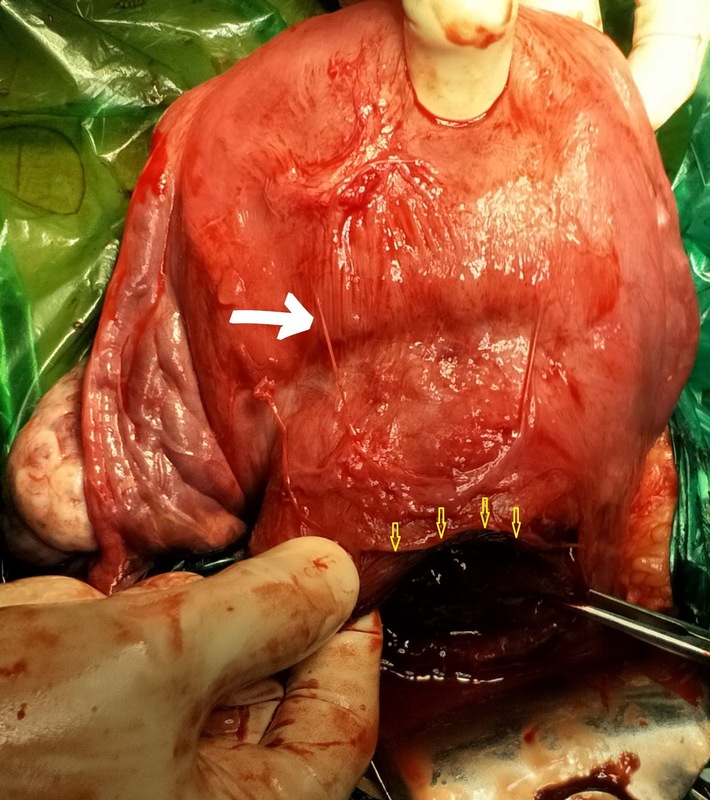 Taga et al conducted a study involving seven cases of ELBW infants delivered through transverse fundal incisions; wherein the placenta was covering the entire anterior wall. A similar case has been published by Kotsuji et al, where a transverse fundal incision was used in a case of placenta previa to reduce the intraoperative blood loss. Classical teaching mandates taking of the incision in the lower uterine segment by identifying the junction of the uterovesical fold, dissecting the bladder away, and incising below the part which is the junction of the upper and lower segment. An incision at the upper part of the lower segment has been shown to reduce blood loss, enhance uterine retraction, predispose to fewer complications, is easier to repair, precludes bladder adhesion to the suture line and reduce operation time. However, when such different methods (incisions) are used, there should be meticulous documentation; which will aid the clinician treating the next pregnancy. In women after two lower segment cesarean scars, scheduling an elective cesarean section at around 39 weeks compared to at around 38 weeks is associated with an higher risk for maternal adverse outcome with no apparent advantage in terms of neonatal outcome. To conclude, there was no dilemma in this pregnancy (third) in scheduling the patient for a cesarean section due to previous operative findings. However, the dilemma in the cases where no intraoperative details are available is highlighted. These clinical decisions should be modified on individual presentations. Shipp TD, Zelop CM, Repke JT, Cohen A, Caughey AB, Lieberman E. Intrapartum uterine rupture and dehiscence in patients with prior lower uterine segment vertical and transverse incisions. Obstet Gynecol. 1999; 94(5 Pt 1):735–40. Taga A, Kondoh E, Hamanishi J, Kawasaki K, Fujita K, Mogami H, et al. Transverse fundal uterine incision for delivery of extremely low birth-weight infants. J Matern Neonatal Med. 2014; 27(12):1285–7. Kotsuji F, Nishijima K, Kurokawa T, Yoshida Y, Sekiya T, Banzai M, et al. Transverse uterine fundal incision for placenta praevia with accreta, involving the entire anterior uterine wall: a case series. BJOG. 2013; 120(9):1144–9. Shao Y, Pradhan M. Higher Incision at Upper Part of Lower Segment Cesarean Section. J Nepal Med Assoc. 2017 52(194):764–70. Melamed N, Hadar E, Keidar L, Peled Y, Wiznitzer A, Yogev Y. Timing of planned repeat cesarean delivery after two or more previous cesarean sections – Risk for unplanned cesarean delivery and pregnancy outcome. J Matern Neonatal Med. 2014; 27(5):431–8.